Home Community Visiting Vet: Why does Tomcat get FIA? Visiting Vet: Why does Tomcat get FIA? Young male cats who go outdoors can be more at risk. When I was a young veterinarian, there was a disease called Feline Infectious Anemia. Classic symptoms were fever, pale mucous membranes, sometimes jaundice, usually anorexia, and weight loss. Our differential diagnoses included feline leukemia virus (FeLV), feline infectious anemia (FIA), or both. FIA was caused by an organism called Haemobartonella felis, which we shortened to “hemobart.” We could test for FeLV easily, but FIA was more difficult to diagnose so we often treated based on clinical signs and presumptive diagnosis. Over the last few decades, with technological advances such as gene sequencing, scientists have reclassified the organism that causes FIA as a mycoplasma, specifically Mycoplasma haemofelis. A second variant, Mycoplasma haemominutum, has also been identified. (It can also cause anemia but usually not as severe.) And because there are other infections that may lead to anemia in cats, the disease is no longer called feline infectious anemia. It is now officially feline hemotropic mycoplasmosis . . . but I’m an old dog, so you’ll forgive me if I just call it FIA. How does Tomcat get FIA? The organism is transmitted by bloodsucking critters like fleas, ticks, lice, and mosquitos, and possibly by cat bites. Young male cats who go outside are at higher risk. So are cats with concurrent immunosuppressive viral infections. It can also be passed from a mother cat to her kittens. When an infected vector, like a flea, bites Tom, it injects him with the mycoplasma organisms. Unlike typical bacteria, these tricky little critters actually go and live in the red blood cells of their host cat. As they proliferate and attach to Tom’s red blood cells, his immune system notices these alien invaders and goes into battle, attacking and destroying the abnormal cells. Clinical signs take one to three weeks to develop. Then the acute phase can last a month or more. Symptoms may wax and wane, as the organism in the body increases and decreases in a cyclic fashion. Tom’s body tries to compensate for the blood loss by making new red blood cells, but eventually is unable to keep up with the destruction occurring. Tom becomes anemic. He will be weak and may have a fever. Look at the color of his gums, which usually are a healthy pink. They will be pale, even white. In December I saw an adult male cat named Dane who wasn’t eating well. At his first visit he had a fever and had lost weight, but otherwise didn’t seem that sick. His gums were nice and pink. We tested for feline leukemia virus, feline immunodeficiency virus, Lyme, Ehrlichiosis. A “complete blood count” indicated Dane was just marginally anemic, nowhere near the kind of anemia typically seen with FIA. Fevers of unknown cause are common in outdoor cats and often resolve with supportive care, which is what we did, including broad-spectrum antibiotics. A month later, however, Dane returned. Profoundly anemic. Critically ill. I was really worried. Had I missed a case of FIA? Diagnosis of FIA can be difficult. Sometimes we can identify the organisms on red blood cells just by staining blood smears and looking under the microscope. But mycoplasma does this weird cycling thing in which the amount of the organism in the blood can change dramatically in just a few hours. One source states the number of infected red blood cells can go from 90 percent to one percent in three hours. So depending on when the blood sample is taken, the chance of finding organisms on a blood smear varies widely. Nowadays, we also use a test called PCR that can detect small amounts of DNA from the parasite in Tom’s blood (as long as it is done prior to starting antibiotics.) There are also serologic tests that can be helpful, but definitive diagnosis can be problematic and expensive. Doxycycline is the antibiotic effective against FIA, but it poses a potential problem for cats. Given in tablet form, doxycycline can irritate a cat’s esophagus, leading to a stricture that impedes passage of food into the stomach. We can minimize the risk by following tablet administration with a dollop of soft butter, or teaspoon of water . . . but Tom isn’t always cooperative. Having doxycycline made into liquid suspension by a compounding pharmacy is a better choice. Medication is generally prescribed for three weeks. In some cases, corticosteroids like prednisolone are also indicated to help slow destruction of red blood cells by Tom’s overstimulated immune system. Cats with extreme anemia may require blood transfusions to survive the worst stages of infection. Prognosis varies. The severity of illness may range from subclinical to life-threatening. Cats that recover often remain lifelong carriers and may relapse under stress. 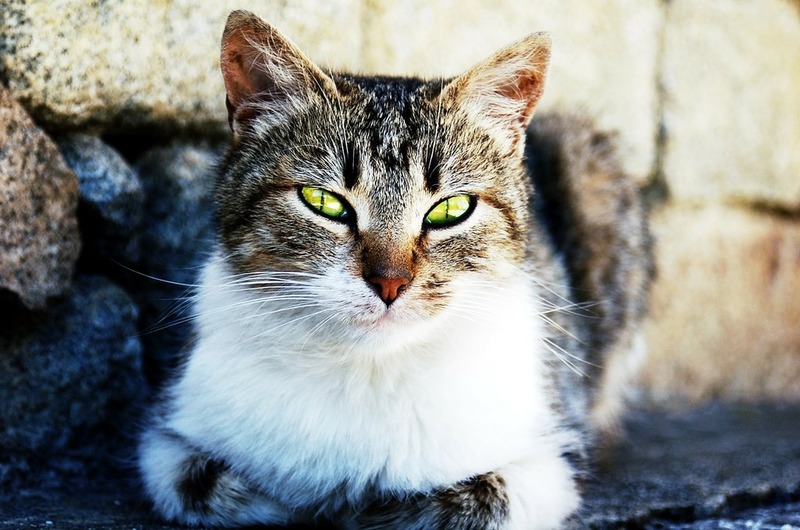 PCR testing indicates that up to 10 percent of healthy cats may carry mycoplasma but never experience clinical disease unless they have some concurrent illness or immunosuppression. Concerned that Dane might have FIA, we started doxycycline and prednisolone and discussed blood transfusions, but it was soon evident he wasn’t going to make it. We had to let him go. We sent blood samples taken postmortem to the lab, then waited anxiously for results. Sad as I was at his passing, I was relieved to confirm his anemia had not been caused by mycoplasma, that I hadn’t missed it. The final diagnosis remains unknown but is suspected to be a virus or cancer affecting his bone marrow. Then there’s Blanche. I wrote about her and FIA in 2013, when she had an episode of fever and profound anemia, which responded beautifully to doxycycline and prednisolone. This year at her annual visit, she had lost weight so we checked a complete blood count. Much to our surprise, she was extremely anemic again, even though she had no other signs of illness. I suspect Blanche is a Mycoplasma haemominutum carrier, and that the stress of recent construction being done in her house precipitated a relapse. Here’s hoping she responds well to medication again. Whether you call it hemobart or mycoplasma, feline hemotropic mycoplasmosis or just FIA, it’s a tricky disease.